Fenugreek, (aka 'methi' in Hindi) which has numerous health benefits, requires some patience when using in its fresh form, though when used dried, can also enhance dishes with a distinct leafy flavor. 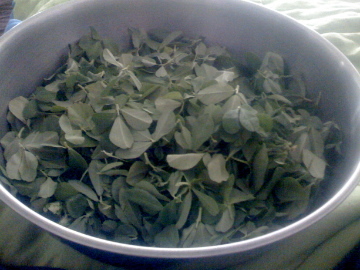 The fresh leaves are slightly bitter, and its yellow flowers are bitter still, but when cooked with ingredients like milk and tomatoes, the bitterness is neutralized. 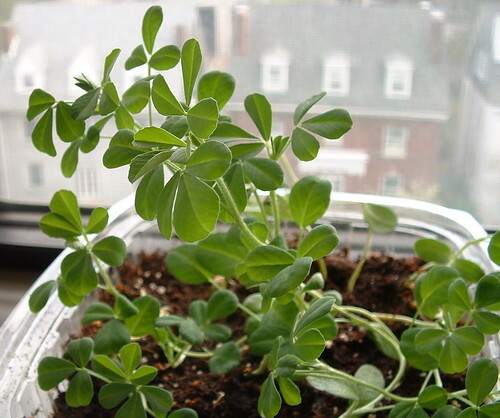 When cleaning fenugreek, behead the leaves from the stems, discarding (into your compost) the flowers as well. Plunge the leaves in a deep bowl of cold water and let sit for 3 - 4 minutes until the sand falls to the bottom. Fish them out with your fingers and discard the bowl of sandy water into your plants, and wash again. If you don't wash them well, you will find grains of sand in your teeth, as the lazy old me had when I tried to dodge this step. As I use my fingers to separate leaves from stems, I feel like my grandmother, who would sit in her sunny kitchen every morning trimming, cleaning and chopping vegetables that she would cook so hauntingly well. Combine dry ingredients, then mix in the rest with your hands to make a smooth semi soft dough. If dough sticks too much to your palms while kneading until smooth, add flour, but you want a soft smooth dough, nothing dry. Divide into 10 golf balls and roll each thinly (as thin as you can roll them!) and evenly. Cook in a pan on medium heat until a slight skin forms, about 10 seconds, then flip and cook for about a minute or so, and lastly, add a drop of oil or a knob of butter and flip again, cook 10 seconds, pressing down firmly with a spatula for even cooking, and add a small knob of butter to end. The key is gentle cooking for cinnamon-colored polka dots blisters all over this unique flatbread. Enjoy with a cup of tea for breakfast or for snacking through the day.